Do you want to be beautiful? Do you want beautiful skin, hair, physique…? One way to create beauty is with a mantra. As you guys know from reading my ultimate guide to mantras, mantras are sacred sounds with transformative powers. We can use mantras to create beauty. One of the best mantra for beauty is the Surya Mantra. This is the best mantra mudra for skin problems and hair growth. The Surya mantra has the power to make people beautiful both inside and out. Today everyone is meditating for beauty. Even famous models are doing it (read the link above). But it all started in India. Indian women are truly beautiful. Travel to India and you will see so many beautiful women. And I’m not just talking about Deepika Padukone, but most Indian women. You have to wonder why. Maybe it’s because they eat lots of food that is good for skin. Maybe it’s the lifestyle. Maybe it’s the Surya mantra, the ancient mantra that brings the beauty of the sun god Surya into your body. So many of my female friends often tell me that they wish they had skin as beautiful as most Indian women. It must be a combination of the healthy food, the good weather, and the fantastic culture. What makes Indian women even more beautiful is the fact that, in my experience, they have great personalities and great attitudes. My Indian girl-friends always seem so refined and classy. One of my Indian girl-friends runs an online make-up course. And most of the people who take her course are absolutely mad about her. I wasn’t surprised when her business took off. She’s so intelligent and cultural. Her personality is magnetic, like many Indian women. Recently, my friend and I were discussing why Indian women have such beautiful skin. “Maybe it’s the Surya mantra, the mantra for beautiful skin,” I said. She smiled (beautifully) and asked me all about it. We had such a great chat that when I got home I decided I would write this guide to the Surya mantra. So, what is the Surya mantra? The Surya mantra is a Hindu mantra that is said to create beautiful faces and beautiful skin. It’s a vedic mantra. It will cure skin problems for a lot longer than your average skin purifying mask. And it is the best mantra for hair growth. So try to remember it the next time you use your damaged hair shampoo. Best of all, the surya mantra is very easy. And it is one of the best ways to have beautiful skin. If you are not Hindu you might wonder what a mantra is. Mantras are spiritual words that are recited in the Hindu faith (as well as Buddhism, Vedism, Jianism, and Sikhhims). These mantras are said to evoke real world outcomes. There are thousands of mantras. And each offers its own benefits. One of the ways we can use mantras is for beauty. Just for fun, whenever I go shopping with a girl-friend and she wants to pick up make-up, I say “If I go make-up shopping with you can I teach you a mantra?” I do this for fun, but also because I honestly believe that the Surya mantra will do more for a woman than make-up ever could. The mantra that I teach my friends is an ancient and sacred mantra said to produce beautiful skin. This mantra makes the skin truly shine and cures skin ailments such as eczema and acne. You can read all about that mantra on this page. 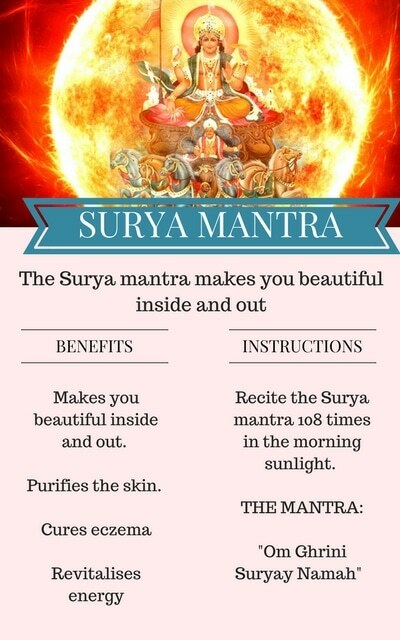 Another mantra I like to show friends is the Surya mantra, a sacred Hindu mantra that cures skin problems. The Surya mantra is one of the best mantras for health (click that link for more). The Surya mantra is a very famous and popular mantra so you may very well have heard of it before. The Surya mantra is the mantra of the sun, the ultimate representation of beauty in the universe. Practicing sun worship is important to all Hindus (Sanskriti has written a great post about sun worship that you might like). And one way of practicing sun worship is by reciting a mantra in dedication to the sun god Surya. The Surya mantra is recited in worship to Surya, the chief solar deity, who is worshipped as one of the five primary gods by the Saura sect, a denominaton of Hinduism. It is said that when you recite this mantra, Surya bestows the gift of beauty unto you. The Surya mantra will make your skin glow and will give you beautiful hair, according to sacred texts. Hindus have used the Surya mantra for many thousands of years in order to achieve beautiful skin. It is said that the Surya mantra revitalises the life energy inside the body and purifies the skin, leaving the individual looking beautiful. The Surya mantra is also said to cure skin diseases. Want to learn more mantras? I highly recommend that you read Mantras: Words Of Power. It’s the best mantra book. Period. And considering how important sleep is for beauty, it’s a good idea to recite these mantras for good sleep. We can also meditate to lose weight. One tip for losing weight with meditation is to use the Surya mudra. The Surya Mudra is the “Sun Gesture,” “Surya” being Sanskrit for “Sun” and “Mudra” Sanskrit for “Gesture.” This is one of the of the most popular mudras seen in Yoga courses and is a good exercise in weight loss programs. My personal number one tip is to use meditation to lose weight, but I like to complement meditation by using the surya mudra. You might like to look at my introductory course on mudras before beginning. Try the Surya Mudra now so you can feel its powerful effect on you. Hold for five minutes before continuing to read the rest of this page. Because it increases metabolism it is a good mudra to use on weight loss programs. It is a natural remedy for common colds. 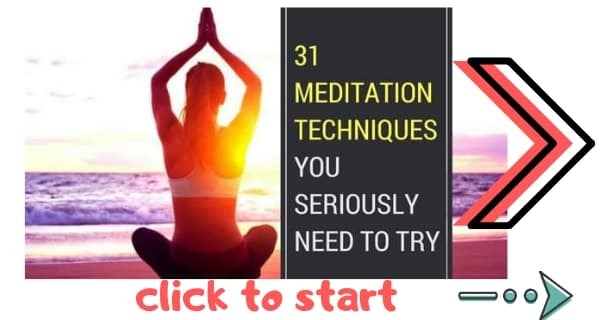 > Learn all the best mudras here. Jacky, surya mantra would help u and by the way another suggestion, Lord Shiva is worshiped for any kind of skin disorder. If u trust have ur full hopes and worship lord shiva. What is the best mantra for vitilgo. To try to get back my brown skin. Jacky, I believe the Surya mantra is probably the best one for you. I am sagar and I m a model but kich dino se mujhme kafi sare badlav aane lage hai mera face puri tarah change ho gaya mujhe meri beauty wapas chahiye kya aap meri help kar sakte ho??? Please tell me the surya mantra for beautiful hair. I am going through a very bad phase.